How can I open the user Library folder in a disk image located on an external disk? The technique of selecting Go and holding down the Option key reverts to desktop computer. You can check your path from a window’s title bar. Phil is referring to the Go menu in the Finder, which lets you select from a number of folders on the startup drive, including some in your Home directory. 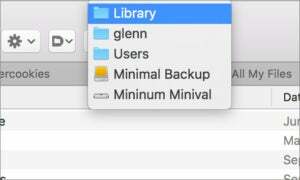 In older versions of OS X, selecting the Go menu in the Finder and holding down the Option key toggled showing the Library folder for the currently logged-in user as a choice. In macOS Sierra, the toggle key is now Shift instead of Option. In the Finder, choose Go > Go To Finder. Now add /Users/philr/Library/ and click Go. You can confirm you’re in the right place by holding down the Command key and clicking on the Finder window’s titlebar name. This reveals the path all the way to the top level of the drive.